Camping out on a beach is a relaxing thing everybody would wish for. But the sun’s UV rays can be harmful that can cause skin cancer, eye damage, and premature aging. In that case, you will need a protection while you enjoy the beauty of the beach. An umbrella tent will be the perfect choice for you. They offer some extra protection from the sun while continuing to enjoy the warm sand in between your toes and the gentle rocking of the waves. They are easy to transport lightweight tents that come in fun colors and patterns. These umbrella tents will make outdoor activities more enjoyable by protecting you from the sun. So these are a must-have for any avid pool and beach goer. There are a number of umbrella tents available in the market. If you go to buy a beach umbrella tent without having a proper research, you will end up buying the wrong product. So it is good to have a proper understanding of the top selling products in the market. But it will be a tiresome task to go to each of their websites to know about each product. If you are worried about this, here is the solution. This post will give all the details of the top selling 11 umbrella tents. You can have a detailed look at each of them and decide to buy which product is the best for you. 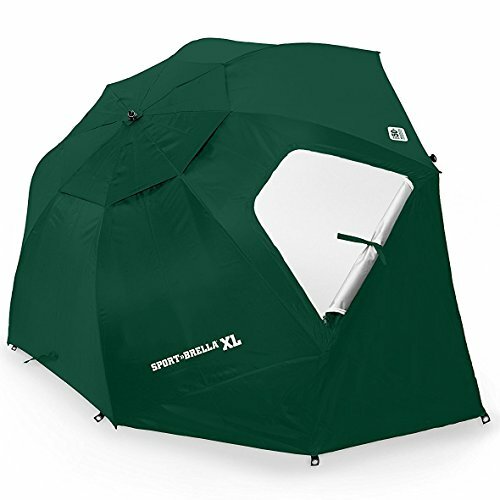 The Sport-Brella X-Large Umbrella allows you to sit and enjoy sporting events or nature in your own environment. It comes with an innovative design that protects you from the harmful rays of the sun without restricting your views. It is sun-safe with a UPF 50+ coating that protects users from more than 99.5 percent of UVA and UVB rays. This umbrella tent has a 9-foot canopy that is made of 210 D Polyester for fundamental all-weather protection. 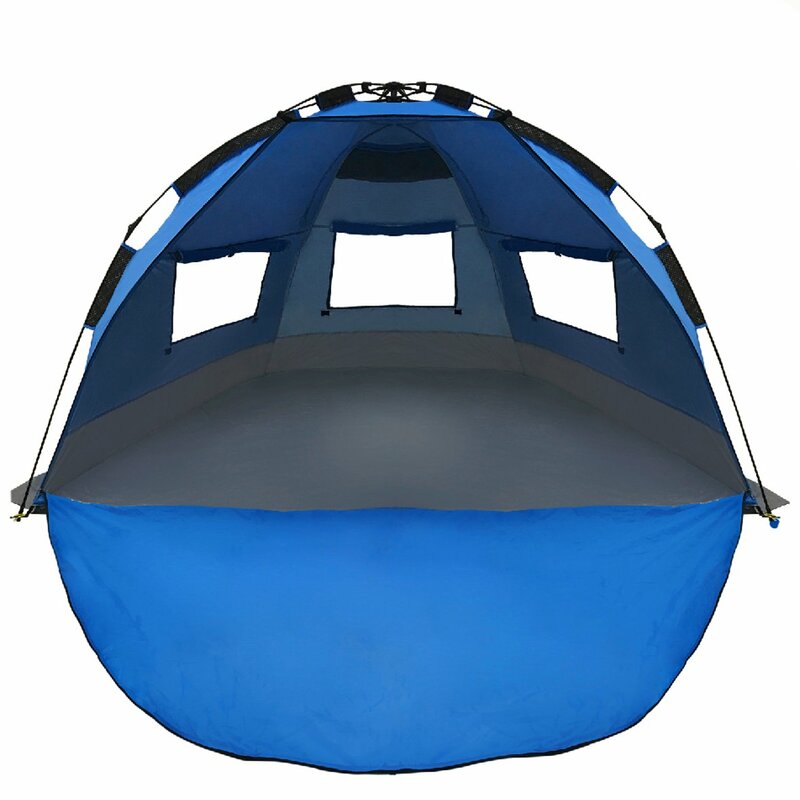 It provides extra visibility with the dual canopy with top vents and side zippered windows. The water-repellent structure will keep you dry and relaxed on rainy game days, or cool from the warm summer sun at the beach. The Coleman DayTripper Beach Shade is a portable pop-up beach tent with 50+ UPF sun protection. It comes with extended front floor zips for privacy. It has back window unzips for ventilation. Coleman DayTripper Beach Shade measures 7 feet 6 inches by 4 feet 5 inches with 4-foot 9-inch center height. You can set it up it 5 minutes. The EasyGo Shelter – Instant Beach Umbrella Tent is the quickest and easiest portable sun shelter available. This is one is a complete unit and perfect as a pop-up shelter for beach fun. 4 people can sit comfortably on the beach under the shade of this umbrella tent. It is designed for maximum shade and minimum footprint. This can also be used at the soccer field as a sports shelter for maximum shade and wind protection. Windows can be opened or closed for your personal preference. The EasyGo Shelter XL – Instant Beach Umbrella Tent is the quickest and easiest portable beach umbrella tent available. It offers great shade and canopy. It is a complete family beach tent unit and perfect as a pop-up quick tent shelter for beach fun. They give you optimum shade and wind protection. This easy up canopy beach sun shelter can be used as a tent for the beach or at the soccer field as a sports shelter for maximum shade and wind protection. It blocks blowing sand and provides optimum shade as a sun shelter. The Odoland Sunshade Beach Tent is a large size tent that not only provides you large space but also great ventilation and wonderful vision due to its innovative design. It keeps you and your kids away from the damage of the strong sunshine. It is easy to set up and easy to store in carrying bags. This product is much more durable due to its fine stitching and structure. 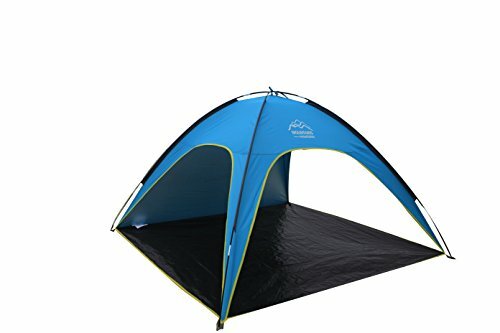 The STARHOME Beach Tent Sun Shelter Camping Tents are ideal for use on the beach or in the garden. It is also great for festivals, fishing or just for the kids to play and rest in. You can use it as kids and pets sun shelter or to keep your gear or food and drink out of the direct sun. It will give some protection from light rain showers too. The FiveJoy Instant Pop-Up Cabana Beach Tent is super easy to set up and provides cooling refuge from hot afternoons on the beach or park. It uses light water-resistant fabrics so you don’t get sprayed by the ocean mist. 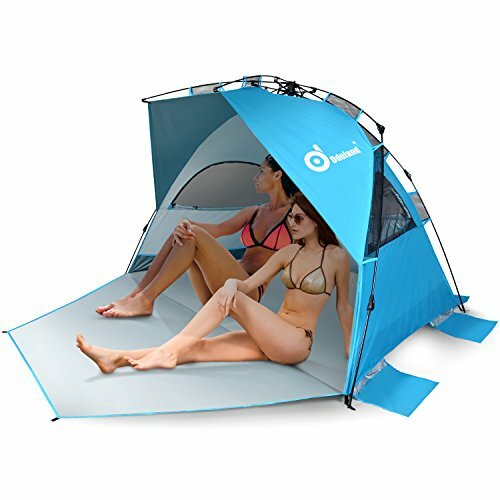 FiveJoy Instant Pop-Up Cabana Beach Tent has UV 30 coating to redirect the sun from your sensitive skin. It is available in three vibrant colors. The OILEUS X-Large 4 Person Beach Tent Sun Shelter protects your family from the sun. 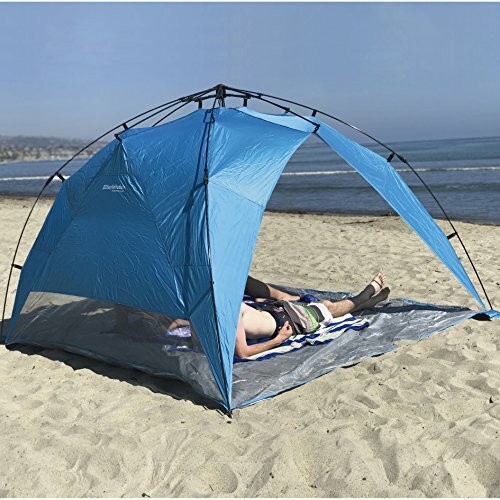 It features 2 windows,6 sand pockets and special UV Guard material for maximum shade at the beach. It is specially designed for easy setup and fold down in seconds. The tent is also just as easy to pack away as it is to set up. There are thick 8.5mm fiberglass poles for added stability with stakes and guy rope. Spacious design provides more comfortable cooling shade and easy to relax inside. The Lightspeed Outdoors XL Sports Shelter Instant Pop Up has 360° views and UPF 50+ protection. They are perfect for those days watching the kids play sports or just spending time outdoors. It is big enough for two adults and tall enough to accommodate them seated in full-size chairs. The Baby Beach Tent Beach Umbrella is designed for children under 3 years of age. There is a mini pool at the bottom where the baby can play without going to the seaside. Thus parents can have extra time to enjoy the beach trip. It can also be used as an indoor play tent for babies. The open size of the product is 47.5* 31.5* 27.5 in. It comes with an automatic pop-up. The LingAo Automatic Pop Up Beach Tent provides better ventilation and protects over 99.5% of UVA and UVB rays. You will get sun protection for all-day shade at the park, beach, sporting event or just relaxing in the backyard with this umbrella tent. It is made of polyester and alloy materials. There are 6 mental stakes and build-in 2 sand pockets for stabilization to keep the tent against a strong wind. These are the top trending umbrella tents on the market. Consider every aspect of each of them before jumping to a decision. There are products with a warranty and without a warranty. You should take great care while buying a product without a warranty. Look deeply into its features, pros, and cons. Make sure that it is the best umbrella tent for you before finalizing your decision.